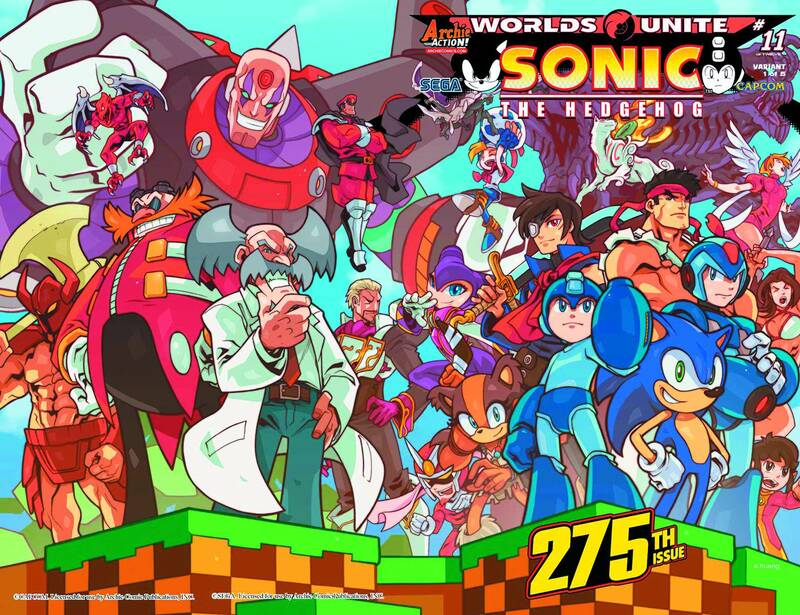 Celebrate 275 issues of Sonic the Hedgehog with his good buddy Mega Man and the worlds of Street Fighter, Billy Hatcher, Nights Into Dreams, Monster Hunter, and more in this double-sized issue! "Worlds Unite" Part Eleven: It's pan-dimensional pandemonium as the unified army begins their attack on Sigma! Sonic, Mega Man, and X lead an all-star roster of heroes from across the SEGA and Capcom universes in an all-out assault against the villainous robot from the future! Will they be enough to save all their worlds, or has Sigma already become a god? Featuring a wrap-around cover from the legendary Patrick "SPAZ" Spaziante! Plus, 5 variant covers from Edwin Huang, Lamar Wells, Tracy Yardley, Rafa Knight, and part 11 of the epic 12-part connecting variant cover series by artist Ben Bates! Don't miss the penultimate chapter to the biggest crossover event in Archie Action history!